ONT is an existential algorithm based on a Novel View of the universe as a complex emergent system. Its algorithmic structure is not dependent on binary digital information (0s and 1s) for expression. Rather, its structure derives from an understanding of the cosmological states of energy density and pressure as layered, dynamic, forceless and yet changeable. ONT's algorithm thus documents the opposite of a non-material or non-real construct for existence such as mind-only models, solipsisms, and simulation or central control scenarios. ONT's dynamics include: three core behaviors that function through tension pairs. Those tension behaviors cycle through eight orders is system-system interactions and through seven orders in self-system interactions. 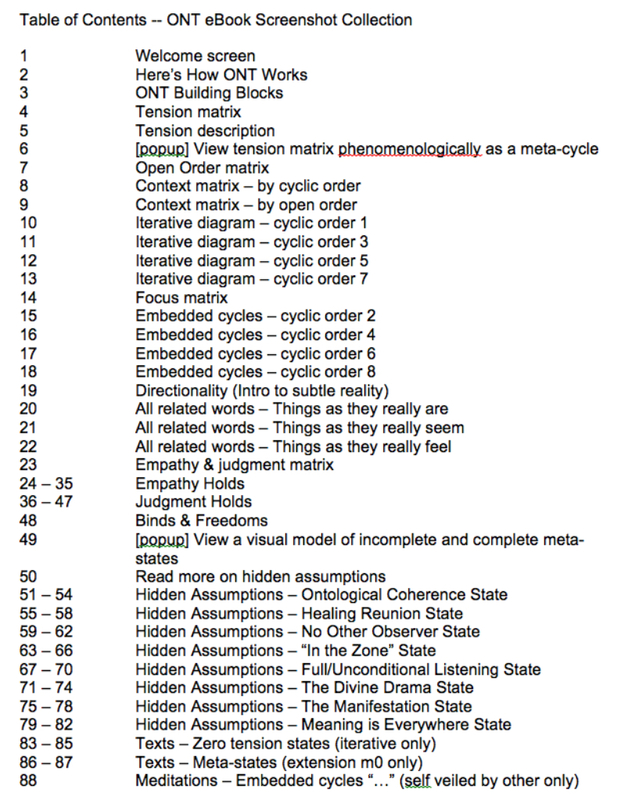 Finally, six types of meta phenomena are characterized. From that its information makes up a dataset of 176 unique states which may be thought of as resonances or Being states. The states derive, at their core, from 12 dynamic states. ONT is not however a "numbers game." Its significance is about harnessing the ability to achieve/model/observe coherence, or resonance, among states at all scales. So far, I have two digital applications of ONT. One is a program for desktops built on a relational database platform. The output is a combination of tabular, graphical, and text-based. Excerpts are below. The other is a WordPress plugin (alpha) Mirror For Your Thoughts. Output is text-based and searchable. 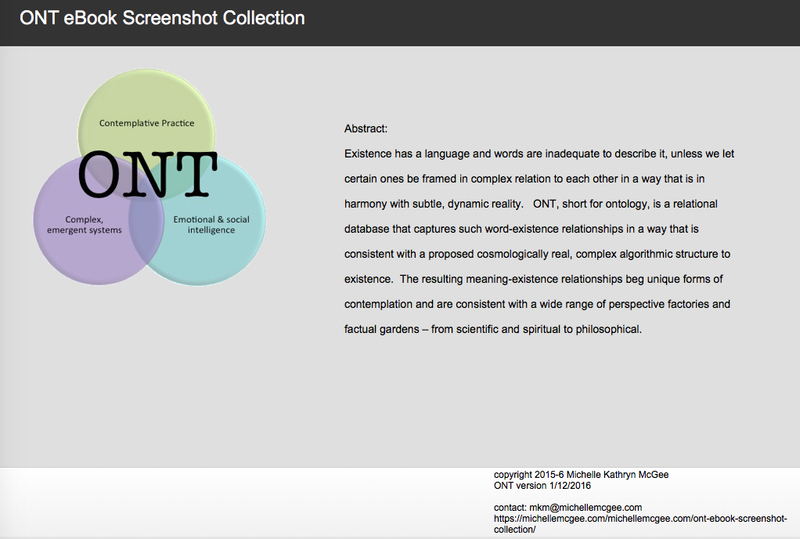 From the relational database version of ONT, I gathered select screenshots from within the program and created an 88-page collection available as a pdf ebook. Below are the cover and table of contents as well as a link to Fundamentals of ONT, a short text-base course for learning the principles behind the algorithm. Download the full 88-page Screenshot Collection here (you must be logged in). Learn about Fundamentals of ONT. Application to enroll is required.